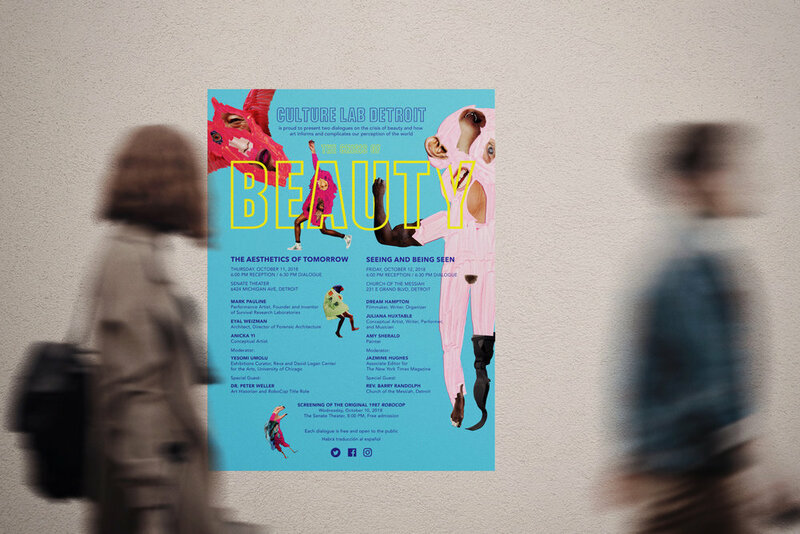 CASE STUDY: CLD "The Crisis of Beauty"
Visually communicating "the crisis of beauty." "Culture Lab Detroit is a non-profit organization that engages with local communities through creative partnerships, projects, and public dialogues to stimulate new relationships, artistic opportunities, and encourages action-oriented social exchange among a global network of artists, activists, and thinkers.” Every year, founder Jane Schulak selects a different theme for Culture Lab's series of fall events which are free and open to the public; Unsold Studio designed visuals for Walls in 2016 and Post-Truth in 2017. Unsold Studio has been the brand design team for Culture Lab Detroit since 2016. In October 2018, Culture Lab Detroit hosted two days of events in Detroit surrounding ideas of “Beauty”, specifically “the crisis of beauty”. Visually communicate “the crisis of beauty"
Accessible for public community, as well as "art insiders"
Keeping these initiatives and challenges in mind, our goal for the design was to visually communicate the concept of the “crisis of beauty” and to raise awareness to drive local, national, and international attendance to Culture Lab Detroit’s 2018 Beauty events. Because the theme of the events was to challenge traditional notions of beauty and to examine its cultural complexities, we had to create something that subverted stereotypes, trends, and any sense of exclusivity that surrounds the idea of beauty in popular culture. At the same time, the dialogues themselves were free and inclusive, drawing both “art insiders” as well as local community members. We needed to make a visual identity system that was engaging to the art and design aficionados, but that remained accessible for the general public. While being visually compelling and sometimes eliciting a sense of discomfort, the design still had to retain a relatability and intrigue to ensure that no one felt excluded or repelled. The 2018 dialogues exist in a series with the Culture Lab Detroit events from previous years. In 2016 the theme was Walls, and in 2017 the theme was Post-Truth. From a visual design standpoint, we ensured that The Crisis of Beauty had a visual relationship to the previous events, while demanding its own unique identity. We blurred the lines between ugliness and beauty by disrupting, breaking, or hiding the human form. During our ideation phase, we explored the concept of masks, and experimented with collage and drawing. We also considered how technology, the media, and different cultures affects our understanding of beauty. 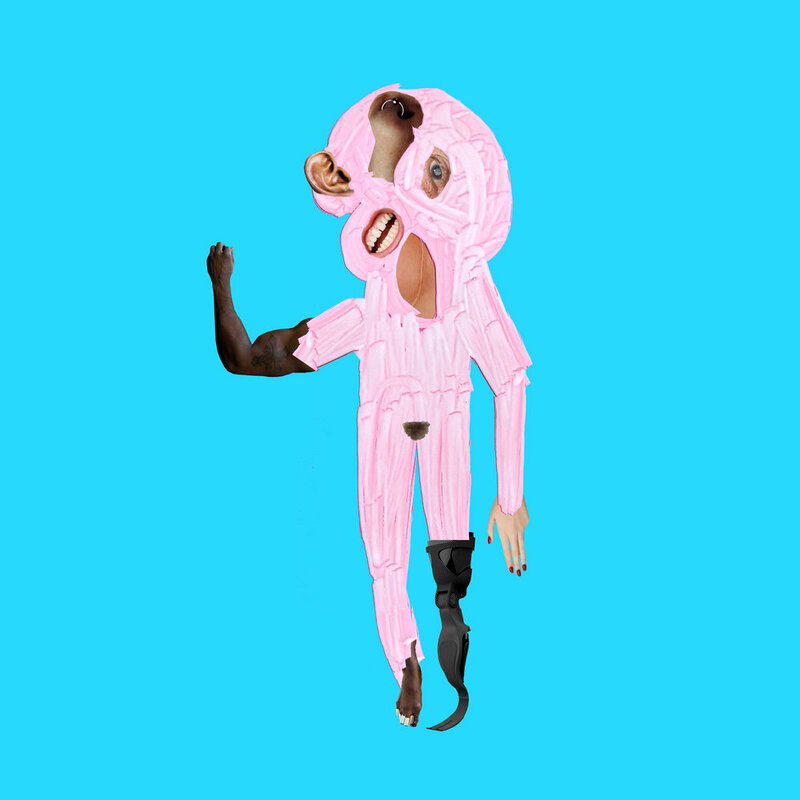 By combining human and animal body-parts, patterns, textures, and references to technologies, we strived to make the familiar unfamiliar and to find beauty in ugliness. Additionally, we sought to include as much variety as possible when it came to representation of race, gender, body size, age, and technology to create a holistic vision of beauty. We also wanted the “characters”, as we called them, to have a variety of perceived personalities. Some could be approachable, while others scary, for example. 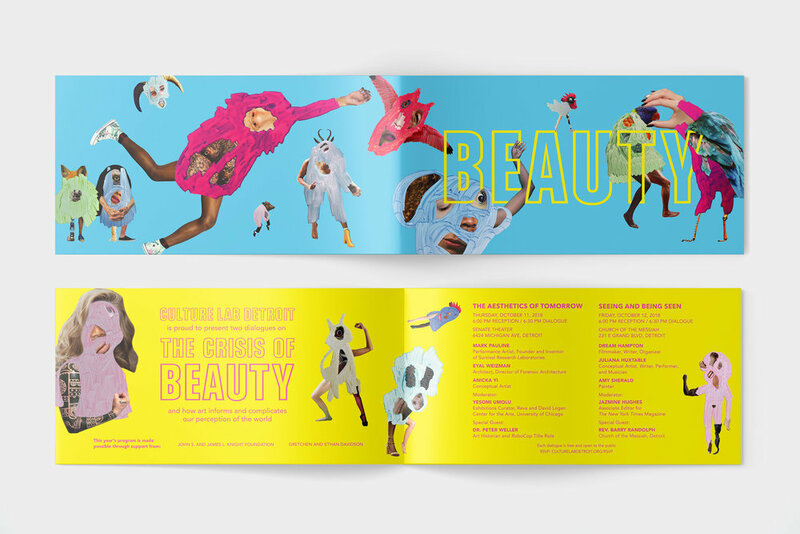 A final set of twenty characters was developed and used throughout the visual assets of the Beauty events. Deliverables included, but were not limited to: digital and print invitations, digital and print posters, digital and print advertisements, promotional postcards, a direct mailer, motion graphics, website assets, social media assets, and t-shirts. Each printed asset was produced in both English and Spanish to be inclusive of the neighborhoods where the events take place, ensuring residents were aware of the program being held in their neighborhood and were welcomed to attend. The above character illustration was selected by a jury to be featured in Icon10: The Illustration Conference’s Detroit Gallery Show at Red Bull House of Art in Detroit, MI in July 2018.